Well, I finally did it. I replaced Ubuntu 9.10 on my desktop with Linux Mint 11 (Katya). The only reason I did it was because I wanted LibreOffice and Firefox 5 but it was definitely time to clear out a lot of junk which I never use anyway. 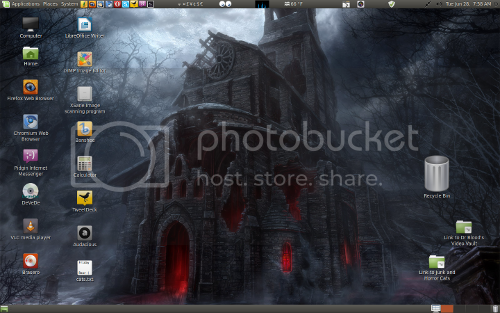 My Acer desktop is almost three years old now and it's been very good with Ubuntu 9.10. If Canonical hadn't discontinued support for "Karmic Koala" back in April, I would have been very happy with it forever though I did have to use "Minefield" instead of the real Firefox 4 at the end of its life. Anyway, I would have gone for the latest Ubuntu 11.04 (Natty Narwal) release but, having had no real luck with it on my laptop, I decided to put Mint 11 on it instead. Linux Mint 11 is basically the same Ubuntu operating system anyway but with a few bug fixes, all the codecs already added, a slightly different Software Manager and a Windows-style menu. As you can see from the screencap, I started fiddling with the themes and got it looking a lot like a standard version of Ubuntu's Gnome desktop again. I really don't like the special Mint menu or the green themes so you probably wonder why I choose Linux Mint over Ubuntu at all and, now that I've installed everything, I do too. I suppose that I could have just changed the Ubuntu 11.04 settings but I honestly didn't have the patience. Linux Mint 11 already came with 90% of all the programs that I use regularly without any further downloads so it saved a lot of time. I think it took less than two hours to put everything back to how it was. I added Xsane instead of Simple Scan (which is too slow for me) and a few other programs which you can see. I'm more of a "double-click on the desktop" person than a "quick launch" user so I always end up with a ton of icons on the desktop. It may not be the best way to do things but it makes me happy and I'm comfortable with it. As with every Linux installation, I did have to tweak a few things to get it how I wanted. Not only did I download a ton of themes to play with (and swapped the window buttons back to the right side when I needed to) but I changed Compiz to Metacity since the latest release of the former is really buggy. Linux Mint has sort of got rid of the Plymouth splash screen by making it completely black which is a weird thing to do but seems to make everything load slightly quicker from a cold boot. I'm not sure what else has been changed apart from removing Evolution for no good reason and Tomboy Notes is no longer the same. It can't be added to the panel in the same way which is quite annoying though it's been that way since Ubuntu 10.10. For now, I'm almost content with Linux Mint but I'll probably wipe it when the next Ubuntu comes out in October. I still think that Ubuntu 9.04 was the best version of Linux so far and I often wish that the developers wouldn't keep changing things every six months but, other than moving to Debian completely, I have no choice if I want to stay on the bleeding edge. I never use the upgrades and always go for a complete reinstall which is no trouble at all really apart from putting a few passwords back in. Linux Mint 11 has a few quirks including the Software Manager not refreshing to show that programs really have been installed but I've got used to it and it's only a couple of extra clicks to make sure. So far I think it's a good version of Linux but I don't feel quite as safe with it as Ubuntu 9.10 and it just doesn't look right yet. I felt the same way since Ubuntu 8.04 so I'm probably just being paranoid.